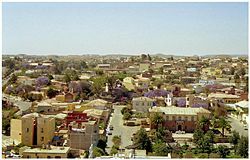 Nickname: Piccola Roma "Little Rome"
Asmara, the capital of Eritrea, was born out of a union of four villages during the twelfth century. During the Scramble for Africa in the late 19th century, Italy began vying for a possession along the strategic Red Sea coast. After encountering stiff resistance in the Eritrean highlands, Italy occupied Asmara in 1889. Italian dictator Benito Mussolini's Fascist troops used Asmara as the base for the invasion of Ethiopia in 1935. At the time, Mussolini had great plans for a second Roman Empire in Africa and Asmara became known as "Little Rome." 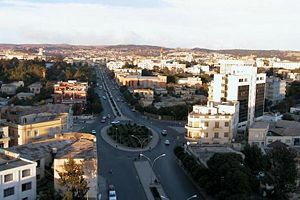 Asmara is praised for its peaceful, crime-free environment, and for being one of the cleanest cities of Africa. Features include designated city zoning and planning, wide treed boulevards, political areas and districts, and space and scope for development. Although poor and generally run-down, the city displays most early twentieth century architectural styles - neo-Romanesque, Victorian, Art Deco, Cubist, and Futurist - and incorporates many features of a planned city. Many of the city's historic buildings are neglected, and there is a risk that this heritage could be lost. Support for proper conservation would help to preserve these buildings, as well as bring additional income to the city through tourism. At an elevation of over 7,627 feet (2325 meters), Asmara is on the edge of an escarpment that is both the northwestern edge of the Great Rift Valley and of the Eritrean highlands. The highlands are drier and cooler than elsewhere in Eritrea. Asmara's January mean temperature is 56.8°F (13.8°C), while the July temperature is 61.3°F (16.3°C). Precipitation averages 1.8 inches (45.72mm) each month, with increased precipitation between late June and early September. The Gash River rises near Asmara, flows south, turns west and forms the border between Eritrea in the north, and Ethiopia in the south, then flows into northeast Sudan. The palm-lined main street, which is the location of the Roman Catholic cathedral and the Grand Mosque, is the central focus of the well planned city. Asmara was born out of a union of four villages during the twelfth century. Four clans - Gheza Gurtom, Gheza Shelele, Gheza Serenser and Gheza Asmae - living in the Asmara area on the Kebessa Plateau, united and defeated bandits who preyed on the area. After the victory, the name Arbaete Asmera, which means, in the Tigrinya language, the four united, was adopted. Eventually Arbaete was dropped and it has been called Asmera, though there is still a zone called Arbaete Asmera. Jesuit priests built a church there in approximately 1621. The missionary Remedius Prutky, who passed through Asmara in 1751, described in his memoirs that the church was still intact. Asmara acquired importance in 1881, when Ras Alula Engida, who Emperor Yohannes IV of Ethiopia had appointed governor, founded a market there. 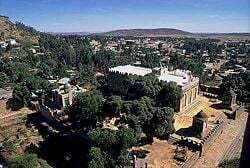 In 1884, the emperor moved his capital from Adi Taklay to Asmara, and had three stone buildings built to house his troops and serve as his banquet hall. About the same time Ras Alula ordered all of the other markets in the Mareb Mellash province closed, giving further economic stimulus to Asmara. The population grew from an estimated 150 people in 1830 to 2000 during Alula's governorship. During the Scramble for Africa in the late nineteenth century, Italy began vying for a possession along the strategic Red Sea coast. After encountering stiff resistance in the Eritrean highlands, Italy occupied Asmara in 1889, which became the national capital in 1897. The city therefore bears many traces of the Italian colonial area: in its infrastructure, its architecture and some culinary traditions. In the early twentieth century, a railway line was built to the coast, passing through the town of Ghinda, under the direction of Carlo Cavanna. In earthquakes that occurred in both 1913 and 1915 the city suffered only slight damage. Italian dictator Benito Mussolini's Fascist troops used Asmara as the base for the invasion of Ethiopia in 1935. At the time, Mussolini had great plans for a second Roman Empire in Africa. Most of central Asmara was built between 1935 and 1941 - the Italians managed to build almost an entire city in just six years. The city was supposedly proof that Fascism was "working." The Italians changed the face of the town. The city is littered with Italian colonial villas and mansions. At the time, Asmara was called Piccola Roma (Little Rome). War cut this short however, and Asmara was governed by the British from 1941 until Eritrea’s federation with Ethiopia, under Emperor Haile Selassie, in 1952. A United States telecommunications base was sited there from 1942 to 1977. During the Eritrean war for independence from Ethiopia (1961-1991), Asmara's airport became a key in the conflict, as it was used by the Ethiopians to obtain arms and supplies from outside supporters. The last town to fall to the Eritrean People's Liberation Front in the Eritrean War of Independence, it was besieged in 1990 and was surrendered by Military of Ethiopia troops without a fight on May 24, 1991. Asmara became the capital of independent Eritrea in 1993. 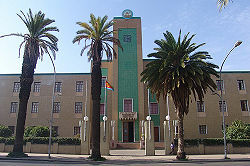 The grand Municipality Building houses the Mayor of Asmara. Eritrea is a single-party state, run by the People's Front for Democracy and Justice (PFDJ). The National Assembly, formed in 1993 shortly after independence, comprises 150 seats, of which 75 were occupied by hand-picked Eritrean People's Liberation Front guerrilla members, while the remainder went to people sympathetic of the regime. National elections have been periodically scheduled and canceled. In 2004, the U.S. State Department declared Eritrea a Country of Particular Concern (CPC) for its alleged record of religious persecution. Eritrea is divided into six regions (zobas) and subdivided into districts to provide each administration with sufficient control over its agricultural capacity and eliminate historical intra-regional conflicts. 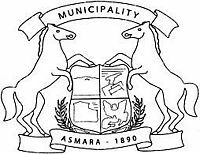 Asmara has a mayor. Textiles, clothing, footwear, processed meat, beer, soft drinks, and ceramics are Asmara’s major industrial products. The city is a marketplace for agricultural products, and a center for tanning hides. The Eritrean economy is largely based on agriculture, which employs 80 percent of the population but contributes as little as 12 percent to gross domestic product. Agricultural exports include cotton, fruits and vegetables, hides, and meat, but farmers are largely dependent on rain-fed agriculture, and growth in this and other sectors is hampered by lack of a dependable water supply. Worker remittances and other private transfers from abroad currently contribute about 32 percent of gross domestic product. Per capita GDP for Eritrea was $US800 in 2007. The ruling party maintains control of the economy, and has imposed arbitrary and complex regulatory requirements that discourage investment from both foreign and domestic sources. The government often reclaims successful private enterprises and property. There are five major roads that branch out from Asmara. After independence, new major highways were built and old ones renovated. Asmara is served by Asmara International Airport, which has severe capacity restrictions, due to its small terminal, short runway and 1.5 mile altitude. 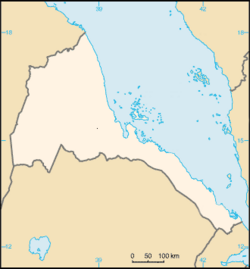 This means that large jet aircraft (such as an A380, MD-11 or 747) cannot fly to the airport, and need to use Massawa International Airport, a port city on the Eritrean coast. 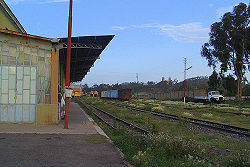 The Eritrean Railway connects Asmara to Massawa. Asmara is home to a population of around 600,000 people. Regarding the ethnic makeup of Eritrea, Tigrinya make up 50 percent of the population, Tigre and Kunama 40 percent, Afar four percent, Saho (Red Sea coast dwellers) three percent, and other three percent. In Asmara, the main language is Tigrinya. Italian and English are widely spoken and understood. Eritrea has two dominant religions, Sunni Islam and Oriental Orthodox Christianity. 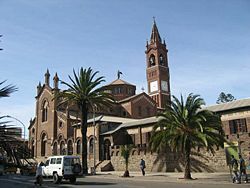 Asmara is also the episcopal see of the archbishop of the Eritrean Orthodox Church, which became autocephalous in 1993. The archbishop was elevated in 1998 to the rank of Patriarchate of Eritrea, on a par with the Ethiopian Orthodox Tewahedo Church. The Asmara Synagogue is the only surviving remnant of the former Jewish community of in the nation. It includes a Jewish cemetery, classrooms, and a main sanctuary. In 2008, the synagogue was taken care of by Samuel Cohen, an Asmara native who remained in the country to look after it. The people in Asmara dress in a unique, yet African style. Asmara is praised for its peaceful, crime-free environment, and for being one of the cleanest cities of Africa. The University of Asmara has more then 2000 day students enrolled in a four-year degree program, and approximately 700 evening students are pursuing two-year extension diploma courses. The city has been regarded as New Rome or Italy's African City due to its quintessential Italian touch, not only for the architecture, but also for the wide streets, piazzas and coffee bars. There are numerable pizzerias and coffee bars, serving cappucinos and lattes, as well as ice cream parlors. Asmara also had more traffic lights than Rome did when the city was being built. The city shows off most early 20th century architectural styles. Some buildings are neo-Romanesque, such as the Roman Catholic Cathedral, some villas are built in a late Victorian style, and Art Deco influences are found throughout the city. Essences of Cubism can be found on the Africa Pension Building, and on a small collection of buildings. The Fiat Tagliero Building shows almost the height of futurism, just as it was coming into fashion in Italy. Essentially Asmara was then what Dubai was in 2008. Architects were restricted by nothing more than the bounds of their imaginations and were given the funds to create masterpieces which we can see today. The city incorporates many features of a planned city. Features include designated city zoning and planning, wide treed boulevards, political areas and districts and space and scope for development. One unfortunate aspect of the city's planning were the different areas designated for Italians, and Eritreans, each disproportionately sized. Asmara has a nineteenth century fort, Forte Baldissera, and the Eritrean National Museum. Situated 7627 feet (2325 meters) above sea-level, the city is the World’s highest capital and therefore a popular training ground for long distance runners. Asmara has been proposed as a possible new addition to the UNESCO World Heritage Sites for its outstanding examples of 20th century architecture and town planning. Many of these historic buildings are neglected, and there is a risk that this heritage could be lost. Achieving this designation would give the city the support needed for proper conservation as well as bring additional income to the city through tourism. The city hosts the "We Are the Future Center", a project of United Nations Human Settlements Programmes, established to mobilize global resources for the benefit of children in conflict and post-conflict cities. This WAF program has six pilot cities: Addis Ababa (Ethiopia), Asmara (Eritrea), Freetown (Sierra Leone), Kabul (Afghanistan), Kigali (Rwanda) and Nablus (Palestine). The center is managed under the direction of the mayor’s office, and the international NGO Global Forum serves as the fundraiser and program planner and coordinator for the WAF child center in each city. Encyclopaedia Britannica Online. Asmara. Retrieved July 13, 2008. United Nations Human Settlements Programmes. We Are the Future Retrieved July 14, 2008.
van der Splinter, Hans. Asmara Asmera.nl. Retrieved July 13, 2008. Ciao Asmara volunteer Justin Hill's book. This page was last modified on 20 April 2016, at 19:52.